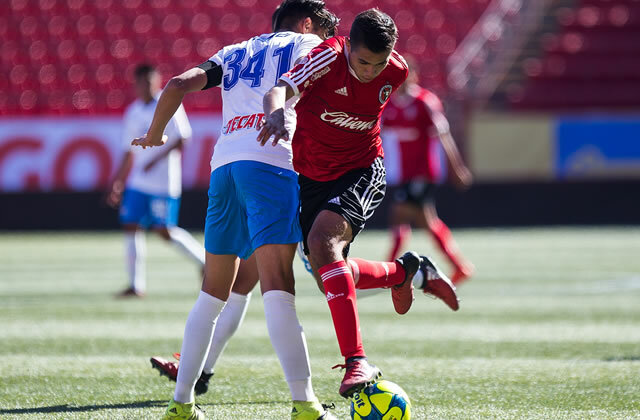 TIJUANA (Jan. 27, 2017) –Club Tijuana Xoloitzcuintles Under-17 squad played to a 2-2 tie against visiting Cruz Azul Friday at Estadio Caliente. Ivan Martinez (7th minute) and Hector Xibelle (77th) scored for the Xoloitzcuintles while Emilio Sanchez (45th) and Carlos Villareal (71st) scored for the Mexico City youth side in the LIGA MX 2017 Clausura Week 4 match. The tie gives coach Gilberto Mora’s team a point in the standings, sending it to seventh place in the standings, heading into the remainder of the weekend games. The Xoloitzcuintles will now travel to face Club Leon Feb. 4 in a Week 5 match with a 9 a.m. kickoff. Club Tijuana: Luis Lopez, Oscar Cisneros, Noe Topete, Edwin Orozco, Jesus Vega (61’ Jaime Velazquez), Emmanuel Haro, Carlos Ramirez (53’ Cesar Castillo), Cesar Rosales, Ivan Martinez (63’ Ettson Ayon), Kevin Zavala (45’ Samuel Lopez) and Jesus Ochoa (45’ Hector Xibelle). Coach: Gilberto Mora. Cruz Azul: Jorge Lima (90’ Erik Lugo), Luis Ramírez (79’ Omar Ochoa), Victor Cuevas, Pablo Guzmán, Sebastian Garcia (63’ Salvador Franco), Edwin Meraz, Hector Gonzalez, Liciano Bocco (54’ Carlos Villareal), Mario Huerta (29’ Juan de la Peña), Emilio Sanchez (66’ Diego Choreño) y Brandon Abundiz. Coach: Porfirio Jimenez.